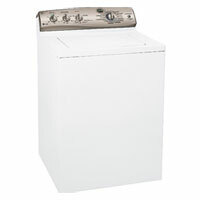 For $650, this top loader from GE cleans laundry very well and is highly water efficient. You can adjust the water level for each load so no water is wasted. Because it lacks a central agitator, clothes won’t get tangled or beat up in the washer. Also, as a top loader, it holds larger loads than most front loaders in this price range. The design is simple and clean with attractive titanium accents on the console. The rotary dials and LED screen make programming cycles easy and straightforward. Vibrations are at a minimum—no rocking or shaking. Most customers give this model satisfactory ratings all around.